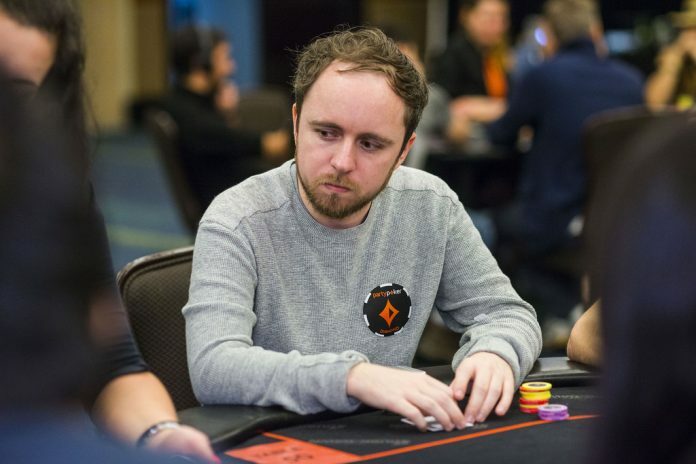 partypoker ambassador Patrick Leonard won over $69,000 after he took down Event #83 High Roller: $1,050 NLHE 6-Max PKO. A $311,100 prize pool was created after 305 entrants took part, and at the final table of six was Leonard’s fellow partypoker teammate Joao Simao, who exited in 5fifh place for $8,387 + $6,695 (in bounties). ‘Garrin4e1‘ was awarded $12,200 + $2,990 in fourth place and ‘benderbei1‘ took away $16,775 + $9,336 in third. Leonard then sent ‘Tomateeee‘ to the rail as runner-up for $23,256 + $8,835, as the Brit picked up another POWERFEST title to add to his collection. Ramiro ‘letsgodancing’ Petrone came through a steller final table line-up to claim the glory in Event #85 High Roller: $530 NLHE PKO Fast. Patrick Leonard was looking for his second POWERFEST title of the day but fell in sixth place before ‘seotaiji86‘ exited in fifth place. Chris Moorman just missed on a podium finish after he departed in fourth place and the bronze medal went to partypoker ambassador Bertrand ‘ElkY’ Grospellier for $5,301.37 + $2,542. The final battle saw Pocketfives #10-ranked Petrone up against ‘drewmscott‘ for the top prize as well as the bounty on each player’s head, with Petrone able to go the distance and bank $10,246 + $14,683, as ‘drewmscott’ departed in second place for $7,437 + $1,033. ‘coco60k‘ won $23,443 after coming through a 643 player field in Event #81 High: $215 NLHE Deep. There was a share of the $128,600 prize pool up for grabs with ‘Astralncognita‘ banking $11,265 in third-place. ‘coco60k’ then got the better of ‘matee‘ heads-up for the title with the latter taking away $16,692 as runner-up. ‘Alien_Army‘ beat former PocketFives #1-ranked ‘Doyle_B‘ heads-up to claim victory in Event #82 High Roller: $530 NLHE Mix-Max PKO. Jonathan ‘jgjg3000’ Gill departed in third place for $10,945 + $3,953 (in bounties) before the final two went to battle for the title. ‘Doyle_B’, who has over $10.3m in online earnings, ultimately exited with the silver medal for $15,228 + $2,280 as ‘Alien_Army’ secured the win alongside $20,515 + $25,434. Martin ‘TinyPolarBear’ Stoyanov won over $32,000 after he bested a 940 player field in Event #83 High: $215 NLHE 6-Max PKO. ‘TheDudes777‘ picked up the bronze medal for $9,283 + $2,828 before the final bounty battle got underway, with former POWERFEST champion ‘orud74‘ the player to exit in second place for $12,545 + $3,580. Stoyanov collected his first major online title just ten days after a near miss in Event #26 High when he finished in second place.